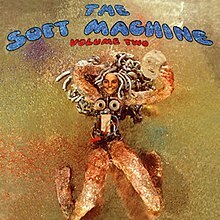 Volume Two is the second LP album by The Soft Machine, released in 1969. A jazz influence is added to the humour, dada, and psychedelia of their first LP The Soft Machine (1968). The album was inspired by The Mothers Of Invention's Absolutely Free and consists of two suites – "Rivmic Melodies " and "Esther's Nose Job" – with "As Long as He Lies Perfectly Still" and "Dedicated to You" serving as interludes. Acting on a recommendation from Zappa, the band split the main tracks into smaller pieces to increase the band's income from the album. In the lyrics to "Have You Ever Bean Green?" Soft Machine thanks the Jimi Hendrix Experience, with whom they had just toured through the United States in 1968; as Hendrix's opening band they were exposed to large crowds for the first time. The title of this song is a play on the chorus lyric in the Hendrix song "Are You Experienced? ", "Have you ever been experienced?". Wyatt thanks "Brian" (Brian Hopper) and "George" (engineer George Chkiantz) in the next section, Pataphysical Introduction – Pt. 2, which also includes a quote of "These Foolish Things." The title of the side-two suite, "Esther's Nose Job", is derived from a chapter in Thomas Pynchon's novel V.
^ Kurtz, P. "Volume Two - Soft Machine | AllMusic". allmusic.com. Retrieved 25 July 2011. ^ "Hugh Hopper - 1962-1972". Hulloder.nl. Retrieved 2011-12-03. This page was last edited on 14 January 2019, at 05:03 (UTC).